PEACHTREE CORNERS, Ga., Feb. 11, 2019 /PRNewswire/ -- New software brand, FunnelAmplified Inc., is set to launch on February 11, 2019. The new brand seeks to help B2B organizations gain more exposure for their content, create higher engagement rates, position their team members as industry thought leaders and generate more leads resulting in revenue growth. I’m Brandon Lee, the founder and CEO of FunnelAmplified. Today, I want to share with you my entrepreneurial story. My dad was a business owner. Growing up, I experienced negative aspects of being a child of a stressed and overworked business owner. In those days, I believed if I could make my dad’s daily efforts easier for him as he was growing his business, he would be less stressed and our family would have more peace. That’s why FunnelAmplified was born. FunnelAmplified and its innovative product called Lead-Hubs take the stress of content creation and lead-generation off of the sales people’s shoulders and allows them to focus on selling. Our Social-Ambassadors product takes the stress of brand expansion and social amplification off of the marketers’ shoulders and allows them to focus on producing quality campaigns that generate demand and profitability. Our products help business leaders be less stressed and more effective. That allows for more peaceful and joyful lives at home. 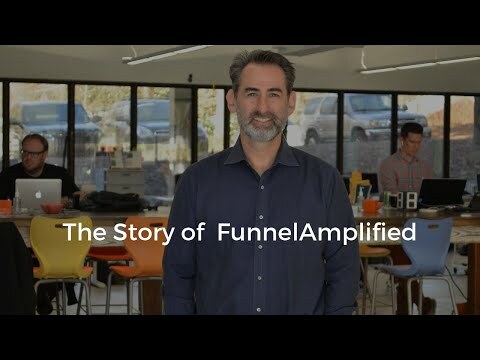 FunnelAmplified allows a company to build personalized funnels, called Lead-Hubs. These Lead-Hubs host brand-approved content for business leaders and are integrated with HubSpot's CRM and Marketing Automation. Each sales person or an executive can be positioned as a subject matter expert with their own personalized hub driving leads and growing bottom line. "Lead-Hubs are a marketer's dream come true," said Anna Szabo, Director of Marketing for FunnelAmplified, "Having been in the industry as an in-house marketer for over a decade, I know the struggle of creating great content that doesn't get enough exposure. I also know how much sales teams need support from marketing with sales-enablement content. Lead-Hubs help teams solve both of these problems. This solution is going to revolutionize the lead generation and revenue growth process for B2B organizations." "Previously, a B2B company's efforts were the only source for its lead generation. With FunnelAmplified's personalized Lead-Hubs, every team member is able to drive demand. This innovative approach also allows marketers to increase their website's domain authority by using Lead-Hubs for link-building and improving SEO," said Brandon Lee, Founder and CEO of FunnelAmplified and a seasoned entrepreneur, "Our software was built to enable salespeople to focus on selling and give marketers a powerful technology for effective campaigns." Lee's passion for this work comes from his childhood experience of being the son of an overworked entrepreneur. "I used to believe that if there was a way for my father to close more deals with less stress, it would have created a more peaceful environment at home," said Lee. "That is the heart behind FunnelAmplified. Our Lead-Hubs help businesses grow faster and easier, allowing individuals the freedom and time to spend with their families." Follow the FunnelAmplified team on social media with the hashtag #FunnelAmplifiers. FunnelAmplfiied is a Software as a Service (SaaS) company enabling sales and marketing leaders to generate leads 24/7 from every member of their team. Founded in 2019, FunnelAmplified helps businesses drive social expansion, content amplification, SEO optimization, brand magnification, lead generation, conversion optimization, pipeline acceleration and growth intensification. For more information, please visit www.funnelamplified.com or follow the hashtag #FunnelAmplifiers on Social Media.